That’s something we can’t say for 10 Pin Bowling. Sure, the staff sterilise the bowling shoes and get rid of the smells but it still always just feels a little bit awkward strapping on someone else boots. Meanwhile on the bowling greens there are more and more places to head out bare foot bowling, and if you’ve seen the quality of the grass at these places it’s a no-contest. You don’t have to be an Iron Man to throw a 10 pin bowling ball but they’re still unnecessarily heavy. Some of us like to compete but we like to keep physical effort to a minimum. 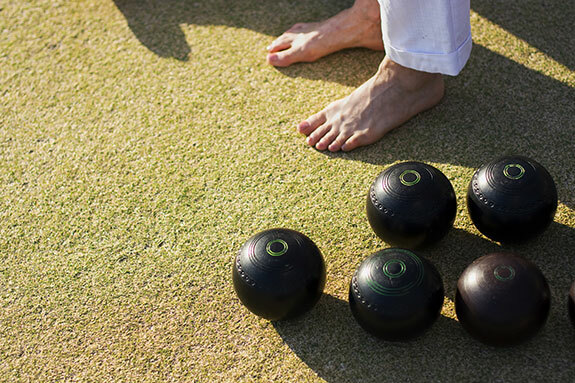 Now, 10 pin has a reputation as being a great pastime for the less athletic of us, but lawn bowls is just downright relaxing. You can’t always be guaranteed cut-price beers at a bowling club but you shouldn’t expect nightclub prices either. That’s something you can’t say for some of the flashier 10 pin joints. The food is usually good and well priced with a classic style menu full of local favourites. Yes the rumours are true, most of the bowling clubs are frequented by some of our older citizens. But, seriously, what’s wrong with that? These guys are great for a chat, have plenty of good bowling tips and are usually thrilled to see new people visiting their club. Heck, half the time they’re planning a barbecue later in the day and they won’t let you leave until they’ve fed you (and until after you’ve purchased the required raffle ticket). When was the last time you could say anything like that about the hollering teenagers at the bowling alley?